This model allows you to test your idea, you don't need any algorithms or back-end , it is very fast way to see if people really need your product. This model allows you to understands how your business work, test your hypothesis, overoll doing things that don't scale is your biggest advantage as a technology startup. Although the model is unsustainable and do not last, it sever as a growth strategy that do not bring in the million users. The model gives you a fundamental of finding your first users and finding product market fit, it's in you to find a way to bring in your first users that is why you must focus on this model to discover those users that are willing to put off your ugly design in order to solve their problem with your product. Another advantage of doing things that don't scale the ability to talk to your users, this should be done constantly to find out more about your users pain point and other things that you can improve your product upon, listening to those users allows you to get sense about how your product is solving their problem and see which feature you need to add or drop because the feature set you start with might not be the feature set y will scale with, so the quicker you talk to users and learn what they actually need, the faster you will reach your product market fit. 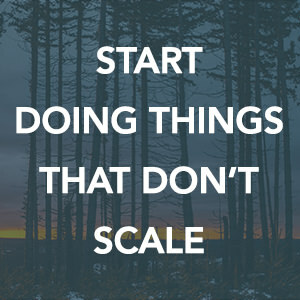 Remember in technology startup problems will always come up, but it actually your duty as a founder to solve those problems, necessity is the mother of invention, do things that don't scale as long as possible. Hope this has help you. do you have anything to say, drop it in the comment box and don't forget to share this with your friend on social media using the social icon below.